Please take time to'really' study these two pictures. Both are photos of Leo (Can/Am Ch Josha's Linebacker CD SOM) taken at different ages. In the first photo, on the left, he is just barely 6 months of age. 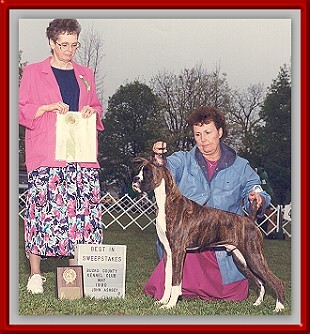 Shown at his first Specialty Sweepstakes, Eastern Boxer Club, held in conjuction with the Bucks County Kennel Club. He was handled by Linda Huffman. Note the Judge.....none other than myself. I was very impressed with this dog the first time I saw him. I just loved the way his neck flowed into his shoulder, the lovely smooth topline and tailset and the effortless way that this puppy moved. I just felt he would grow up to be a good one. Smooth, elegant, just my kind of dog. I took a chance and put him all the way to Best in Sweeps. There were 100 puppies entered in the Sweepstakes. I had the opportunity to handle Leo in Canada. It was an honour indeed to be given the chance to handle him. Leo and I had lots of fun that weekend. BOB at both the Northern Ontario Boxer Club and also the Boxer Club of Canada Regional Specialty from the Veterans Class! 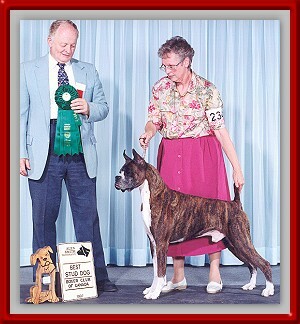 He also took Best Stud dog at both Specialties too.